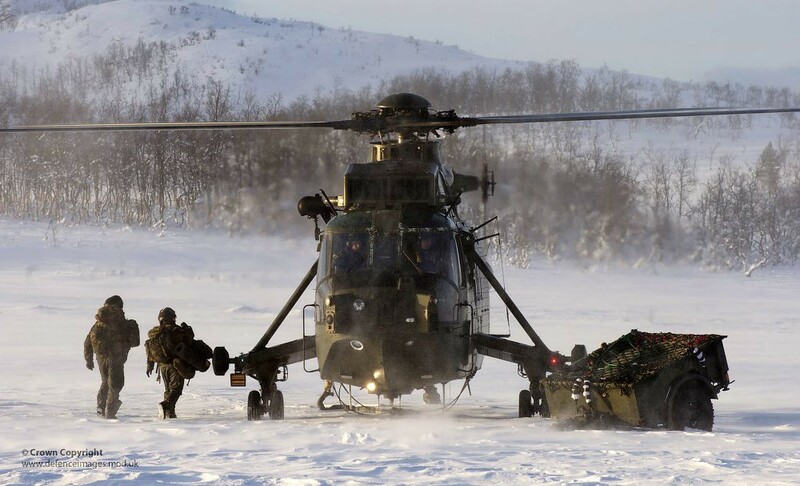 Royal Navy Sea King Mk4 conducting Arctic training. Photo: UK Ministry of Defence/flickr. This article was originally published on the World Policy blog on 17 January 2014. Despite ongoing cooperation between Arctic nations – Canada, Denmark (Greenland), Finland, Iceland, Norway, Sweden, Russia, and the United States– mainstream rhetoric often implies Arctic stakeholders are teetering on the brink of conflict. To a great extent, this sentiment is reflected in mass media and political banter, inflaming the passions of audiences. This is true, not only in the U.S. but also elsewhere, evidenced in the mass media reporting of other Arctic nations and beyond. Consider, for instance, the impact of headlines pronouncing a “New Cold War” or a “Rush for Riches,” headlines not uncommon in U.S. media. Some reactions may be visceral– insidiously implanting notions of fear, lust, or chaos into the very core of society. Similarly, political banter suggesting belligerent rivalries reminiscent of bygone years may well influence public opinion to the detriment of strengthened Arctic relations. A case in point occurred in December 2013 when Canada submitted its claim to the United Nations Commission on the Limits of the Continental Shelf (UNCLOS), verbally asserting Canada’s bond to the North Pole. However, the Canadian government submitted only “preliminary information” on its Arctic, excluding the crucial scientific evidence that would substantiate such a pronouncement. The rules and laws for determining validity of a claimant’s submission are orderly and well defined. Under UNCLOS, all coastal states have rights to the waters and seabed beyond the 200 nautical mile exclusive economic zone, including resources such as oil, gas, and fish, if they can demonstrate that their continental shelf extends beyond this point. Based on an underwater mass, the Lomonosov Ridge, both Russia’s and Denmark’s (via Greenland) submitted claims to UNCLOS include scientific evidence that conceivably links each nation to the North Pole. It is expected that Canada’s next submission will be similar. In Canada, however, this omission began a waterfall of political debate played out in mass media both in Canada and elsewhere. Recent events in December 2013 suggest the Arctic will be swept up in a vortex of militarization and territorial disputes, in a rush for Arctic riches and shipping opportunities. This hawkish posturing, however, is not representative of 21st century Arctic relations, and could, in fact, contribute to a decline in ongoing regional cooperation, should it create an atmosphere of mistrust. Indeed, the U.S. Department of Defense (DoD) 2013 Arctic Strategy makes a compelling argument: “Political rhetoric and press reporting about boundary disputes and competition for resources may inflame regional tension.” Further, the policy report states, “Efforts to manage disagreements diplomatically may be hindered if the public narrative becomes one of rivalry and conflict.” In what could be seen as a highly unusual policy statement, the DoD takes a clear position on the adverse effects of bellicose or misinformed communication to redirect Arctic discourse toward a more accurate appraisal of the persistent multinational commitment to cooperation. So, with over 300 in attendance from over 40 nations, Hagel outlined the department’s Arctic strategy emphasizing President Obama’s fundamental goal to ensure that “the Arctic region is peaceful, stable, and free of conflict.” Hagel explained how the U.S. would strengthen its military-to-military ties between Arctic nations, specifically referencing Russia, lest minds drift to the “us versus them” mentality of the past century. Indeed, all Arctic nations share a common interest in coordinating military activities for numerous reasons brought on by increasing interest in the Arctic region from nations far and wide. For example, even though we have seen a drastic loss of multi-year Arctic ice, this does not mean that conditions for maritime activity are any less treacherous for maritime activity. Indeed, increasing commercial activity and the desire for exotic tourism will assuredly accelerate the need for multilateral search and rescue missions. The importance of cooperation was well illustrated when a Russian research ship, the Akademik Shokalskiy, got stranded in an Antarctic ice pack on December 24, 2013. China’s icebreaker, the Xue Long, or Snow Dragon, made the first attempted rescue. But at 6.5 nautical miles from the 74 passengers including scientists, crew, journalists, and tourists, the vessel itself got stuck in an estimated 4 meters (13 feet) thick ice. French and Australian icebreakers followed, both of which were unable to break through the heavy ice. Passengers were eventually airlifted to the Australian icebreaker, and then airlifted by the Xue Long’s helicopter. The U.S. icebreaker, the Polar Ice, was en route, when the Akademik Shokalskiy and the Xue Long finally broke free on January 8, 2014. This rescue mission alone took the efforts of four countries, countless personnel, and a yet to be calculated financial expenditures shared among nations that came to the rescue. Simply put, rescue missions in the Arctic such as this require a multinational effort. To address issues of this sort in the Polar North, Arctic nations signed the Agreement on Cooperation on Aeronautical and Maritime Search and Rescue in the Arctic (SAR) on May 12, 2011 in Nuuk, Greenland. The Agreement is the first legally binding instrument negotiated under the auspices of the Arctic Council. It coordinates international maritime and aeronautical coverage and response, and establishes the parameters of responsibility across an area of about 13 million square miles in the Arctic. At this point, some may still believe that Hagel’s speech and the DoD’s Arctic Strategy can be dismissed as yet another exercise in political rhetoric. Disagreements are likely: the U.S. and Canada have a long-standing dispute over the legal status of the Northwest Passage. Canada claims the waters of the Passage are internal to Canadian territory, while the U.S. considers it to be an international strait. They have agreed to disagree. Moreover, all nations will defend their sovereignty, should it be threatened. With the promise of development where the potential financial reward is considerable, Arctic nations will attempt to legally establish the full extent of their underwater boundaries. But this does not mean that military conflict will ensue. Rather, the spirit of cooperation and coordination, which was established with the founding of the Arctic Council in 1996, is increasing at a rapid pace. In 2013 alone, an unprecedented number of interstate political, military, and commercial talks took place in addition to the biannual Arctic Council meeting of senior Arctic officials. In January, environment ministers from the eight Arctic nations met to discuss climate change, pollutants, and general protection of the Arctic environment. In February, oil companies ExxonMobil and Rosneft signed agreements opening the door to future collaboration in the Russian and U.S. Arctic. In May, Norwegian and Russian naval forces conducted POMOR 2013 in the Barents and Norwegian Seas. This year’s exercises focused on responses to terrorist threats, search and rescue operations and handling the consequences of an oil spill. POMOR has taken place annually since 1994. Also in May, Arctic Council member states signed the Agreement on Cooperation on Marine Oil Pollution Preparedness and Response in the Arctic, the second legally binding agreement negotiated under the auspices of the Arctic Council. In June, defense chiefs from the Arctic 8 met to consider expansion of military cooperation and increased military support of civilian operations in the region. And for the first time a delegation of Russia’s Northern Fleet joined the Canadian Armed Forces’ annual Operation Nanook, albeit only as observers. When we consider military presence in the Arctic, we must not assume that militarization is on the horizon. Nor should we assume that the Arctic is a chaotic panacea ripe for expansive commercialization. Rather, countless women and men, hailing from an expansive range of associations, nations, and Arctic indigenous groups have contributed invaluable knowledge toward fulfilling the desire for cooperation and peaceful relations between Arctic nations. At the very least, the spirit of the Arctic Council under which members negotiated not one, but two legally binding agreements within the span of two years must be maintained. To not question media headlines or bellicose political rhetoric aimed at stirring domestic passions, not only discredits the work that goes into negotiating the complexities of a warming Arctic, but it is also misleading, if not detrimental to future relations. Erica Dingman is an Associate Fellow at the World Policy Institute.